Webbed fingers and toes are sometimes present at birth. The webbing – syndactyly – is quite normal in early fetal development, and generally the fingers and toes separate around week 16 of the gestation period. However, sometimes this separation does not occur and babies are born with webbed fingers and toes - the second and third fingers and toes are most often affected. 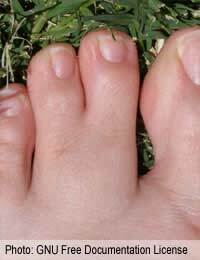 Syndactyly is a condition that is characterised by the union of two or more fingers or toes. This incomplete separation usually involves a connection of skin, but can sometimes also affect blood vessels, tendons, nerves and bones. The webbing connection may extend to the first joint or to the whole length of the digit. Syndactyly does not usually affect the child’s hand movement or walking, although it may restrict finger action in some way. Treatment of this condition requires corrective or reconstructive surgery, involving general anaesthesia. The repair of webbed fingers and toes is generally done when the child is between 6 months and 2 years old. Syndactyly can also occur if someone becomes the victim of a fire. A burn victim’s skin may melt and fuse the epidermis of the fingers and toes. In these cases repair surgery can be performed to improve movement. If there is webbing, along with the presence of an additional finger or toe the condition is known as Polysyndactyly. This can only be corrected by the surgical removal of the extra digit. The treatment of simple webbing, which involves only the removal of skin, is an uncomplicated procedure. After the skin is cut, the small flaps in the webbed area, and at the sides of the fingers or toes, is lifted up and sewn into position. This leaves small areas of missing skin, which is then filled in with skin from the groin area if required. After surgery the area is wrapped carefully in a bulky dressing that restricts too much movement. Small children who have had the procedure, to repair webbed fingers, may need to wear a cast that extends to the elbow. If the webbed area affects fused bones, tendons, nerves and blood vessels, the surgery becomes more complicated. The surgery risks, in this instance, can include excessive bleeding and infection. As with any form of surgery the risks involved are generally associated with anaesthesia. These can include adverse reactions to the medication and infection. Circulation damage can also occur from the application of the restrictive cast or dressings. A short hospital stay of around 1 or 2 days is all that is required. Syndactyly surgery is usually a quick and easy to perform procedure, which requires adequate dressing and medication on completion. If a skin graft is taken proper healing will require the area to be moisturised, as well as protected. Some swelling and bruising is to be expected, but painkillers can be taken to alleviate any pain or discomfort. Unless the thumb joint is affected by webbing, syndactyly does not have to be treated in any way. The webbing of fingers or toes does not pose any health threats, and provided movement is not restricted in any way surgery is not mandatory.